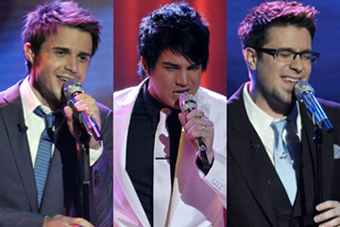 So, this year’s American Idol Top 3 are Kris Allen, Adam Lambert and Danny Gokey. I wasn’t too surprised. I predicted this all-male final. These three have had the most number of fans since the Top 12 were chosen, and I was certain their fans just wouldn’t let them down. But based on last night’s performance (Rock Week), where Danny was obviously the weakest among the four, I was really hoping for him to go. I reckon the judges (except for Simon) were too nice to him. His last note was just awful, but America still made him safe from elimination (safer than getting wholesale term life insurance, perhaps?). And Allison’s performance was definitely way better than his, even if the judges thought otherwise. I loved Allison’s look during the Rat Pack week (photo above). So glam rock! I cried while watching Allison’s final song. She’s not exactly my favorite (I love Adam, by the way), but I thought she rocked it. Probably the best elimination song I’ve heard this season. I’m sad that she had to go, but American Idol winner or not, I think she’s gonna go far! Can’t wait for next week’s performance from the Top 3. Let’s see if America made the right choice by voting the all-male final. **Photo credits go to AmericanIdol.com (Rat Pack week).